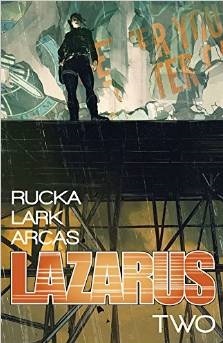 Greg Rucka and Michael Lark’s LAZARUS takes place in a future conceivably (and worryingly) not too far away. The world is no longer divided by political or geographical boundaries; wealth now defines territorial borders, and that power rests with only a handful of families. Those who provide a service for a family are protected and ‘lifted’ to the status of Serf, which guarantees them, and their loved ones, a level of comfort and care unattainable for the rest of the population left to fend for themselves: they are known as Waste. The first volume of the series introduced Forever Carlyle, the Lazarus – or genetically engineered protector – of her family. Uniquely talented and skilled with a variety of weaponry, we witnessed the first cracks in Forever’s commitment to her cause despite a lifetime of programming. I expected LIFT to widen those cracks, and tighten its focus on Forever and her actions – and while it does, it also expands the world previously established, and introduces the Barrett family: Waste who lost everything in a storm, and who know their only hope of survival lies with Lift selection in Denver. Their story parallels Forever’s investigation into a possible terrorist attack on the day of the Lift, and coalesce expertly in the final act. It’s always difficult assessing individual volumes of an ongoing story. By their nature, these stories are ‘in progress,’ so it’s difficult to have the perspective to properly critique it. LIFT seems less focused on Rucka and Lark’s over-arching series narrative, and instead exists as a standalone story, a perfect snapshot of this world they have created. The character moments sprinkled throughout are memorable for their severity: we glimpse flashbacks to Forever’s youth, and the physical and psychological challenges she endured, all in a hopeless quest to earn her father’s love. And the Barrett’s gruelling journey to Denver doesn’t come without loss. Whether we’ll see the Barrett’s again in the series is indeterminable at this stage – I have a hunch they’ll disappear for a while and return in a later volume, rather than become part of the regular cast. LAZARUS is the kind of sci-fi I love; grimy and gritty, in the dirt rather than in the skies. Lark’s artwork is perfect for the tale. Nobody executes such perfectly choreographed action scenes in all of comics, and Rucka knows better than to clutter these pages with captions or dialogue. Indeed, that’s the script’s greatest strength: Rucka refrains from obnoxious captions and inner-monologues. The reader is left to ascertain character motivations from dialogue and facial expressions alone. More writers need to have faith in their readers. If FAMILY hinted at it, LIFT confirms it: LAZARUS is one of the finest comics on the shelves, two creators working in perfect harmony to produce something very special indeed. I’ll see you in around six months for Volume 3.